Guilherme Kramer was born in São Paulo, and now lives and works in Barcelona. From 2006 to 2014, he performed solo and group exhibitions in different cities of Brazil and the world, such as Hong Kong, Barcelona, Rome, Bogotá, Bern, Azores, besides having worked on the backdrop of a dance spectacle in New York. It has been continuously commissioned to paint large areas with crowds and his oniric world, full of symbols and meanings, leaving the paper to cover indoor and outdoor walls, from streets and bars to private homes and corporate environments. An example is “We see people in the crowd” project, for Agência Click Isobar, in São Paulo, in which Kramer painted during one year the walls of their entire office. In 2010, the artist attended the Engraving workshop at Lasar Segall, São Paulo, improving lithography, woodcut and metal techniques. 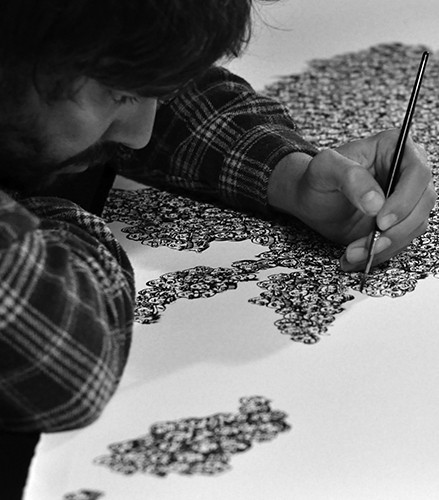 In 2012, he started to study Mural Arts at Escola Massana in Barcelona. Kramer always returns to the paper, the place where has greater ease of expression, but also works on a range of surfaces and media, like glass, stone, ceramics, tiles, furniture and skateboards.